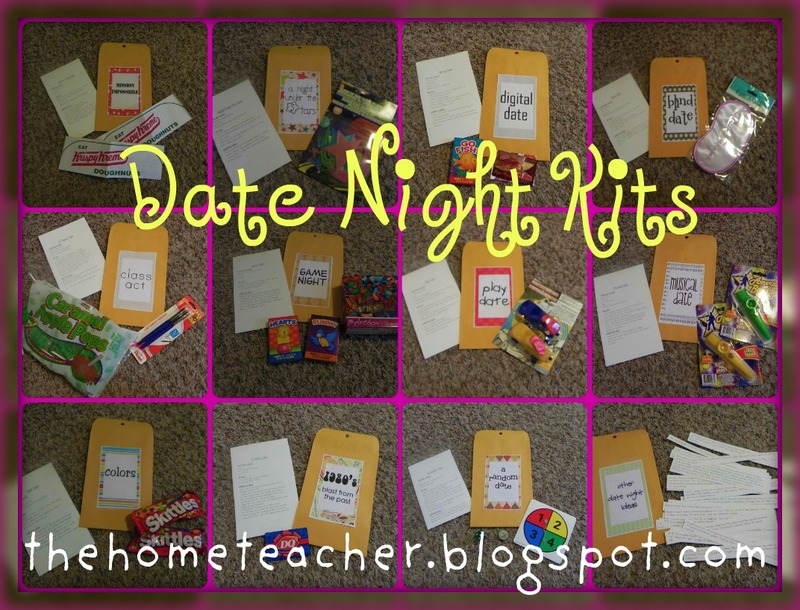 Each themed date night is organized in a manilla envelope with a card of instructions and some of the materials needed. There is also an extra envelope that holds additional ideas for dates on strips of paper. Here is a list of our themes and a brief summary. Click on the theme to download the date night card. Each date night card has a list of materials needed, the plan for the evening, and an “additional ideas” section to further extend your date. I created these just for our little family, so you will see some references to my daughter. Prehistoric Date: Completely inspired from my dinosaur loving daughter- this date takes place at the dinosaur park while afterwards eating a spaghetti dinner sans utensils. And no computers/cell phones/ anything electronic during the date. Can we do it? Service Date: Service brings people closer together, so why not incorporate it into the date night experience? This date centers around donating our talents, material items, and time to others. FYI: one of the additional items is to do the Kmart layaway challenge. This is inspired from this story, where anonymous donors are paying other people’s layaway accounts- especially toys and clothes purchased for impoverished parents. Incredible, right? Play Date: Unsure of what this date is about? Pretending to be a kid again! Playing games like tic tac toe, MASH, jump rope, hopscotch, and hide and seek. The menu for this date: peanut butter sandwiches or macaroni and cheese. Random Date: This date is driven by chance. (hmmm- does that make sense? I shouldn’t be posting after midnight! Geez!) Flipping a coin, rolling a dice, and using a colored spinner will decide the outfits/restaurant/dessert for the evening. Blind Date: No, this is not a date with someone you don’t know… it’s a date in the dark! Choosing an outfit, eating dinner, and decorating cookies needs to be done while blindfolded. 80s Date: Inspired from our childhood… blizzards, pizza, and a good 80s movie. Digital Date: This is the date I am most excited about- not because it will be the most fun, but it is TOTALLY something my geeky hubby will enjoy. And I do blog, so therefore I myself am somewhat geeky :). This date is a nerdy movie/pizza/video game night with a twist. No talking. Only texting. Unlimited texting may be a requirement for this date- especially if you decide to play go fish or another game! Night Under the Stars: Great time to learn about the phases of the moon and constellations! This will be a spring/summer date spending the night under the stars roasting marshmallows and gazing at the sky. And maybe even pitch the tent out in the backyard. Game Night: Not your typical game night…. take a variety of board games, mix them all together, and create new games. I thought it might be fun to watch old game show clips on Youtube, too 🙂 The avid gamers might enjoy this challenge: try and play at least one game from these categories: card game, board game, dice game, word game, children’s game, and brain game. Color Date: This would be the artistic date. We plan on playing the skittles game (similar to the M&M game) because of all the colors (hence the theme name) and creating works of art for each other. Class Act: The teacher in me just HAD to do a scholastic date! Sharpen your pencils, because a written exam is involved…as well as making carmel apples. Yummers! Mission Impossible: This theme is centered around things we love about our church missions. We both served in Toronto, so it is pretty much a Canadian date with doughnuts, hockey, and reading through our old mission journals. I didn’t include the date night card here because everyone’s missions are different, and not everyone has served a mission… but if you are interested in seeing a copy of this date night card email me and I will gladly send a copy your way! Have a fun Valentines Day! Enjoy! This entry was posted in DIY, faith & family, me, Valentines Day and tagged date night on February 10, 2012 by ktoponce.